Down a long dirt road cut through a forest of trees, we drive. Like entering a secret haven that only a few people know. It’s mysterious and thrilling all at the same time. At the end of the tree-lined road, the secret is finally revealed, and River Spring Lodge is before you. There are seven private suites as well as one 4-room sportsman’s lodge available at the 20-acre wooded boutique hotel River Spring Lodge, and we are fortunate to have 2 of the rooms for the evening. Owned and operated by Chef Dave Hamer and his wife Carolyn who runs the front of house; our consummate hosts have decades of experience in the boutique hotel industry. They’ve operated River Spring Lodge since 2016 and have won awards including the 2011 most romantic inn award and the 2018 Certificate of Excellence Award from TripAdvisor. Adirondack chairs circle the fire pit next to a man-made spring fed pond on the well-manicured grounds and once inside the front door of River Spring Lodge we are greeted with piano music playing softly in the background. Looking around instead of a forest of green trees we are surrounded this time with soothing tones of grey, and purple in the furniture and decor next to dark cherry wood tables and chairs, the tables dressed with fine china and crisp white tablecloths. It’s inviting, serene and comforting all at once. My suite — The Basswood is bright and airy, and the king size bed sits high in the room, good thing there is a step to help me climb in and out of bed. Comfortable and cosy; the room is also furnished with a leather lazy boy office chair at the desk, and a leather armchair awaits me. Oh, about that lazy boy desk chair, this is the kind of chair that I imagine high ranking executives have in their office. I want one for my home office, but I’d probably spend more time sleeping in it than working. TIP: If you are looking for outlets to charge your electronic devices, there is a flap on the top of the desk with multiple electric and USB plugs at the ready. 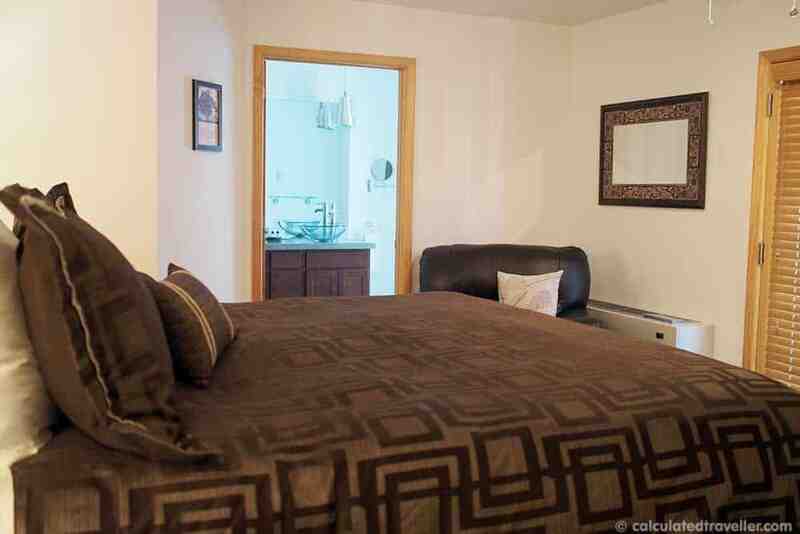 The bathroom is spacious and luxurious with two glass sinks, a separate shower with rain shower head and separate tub. 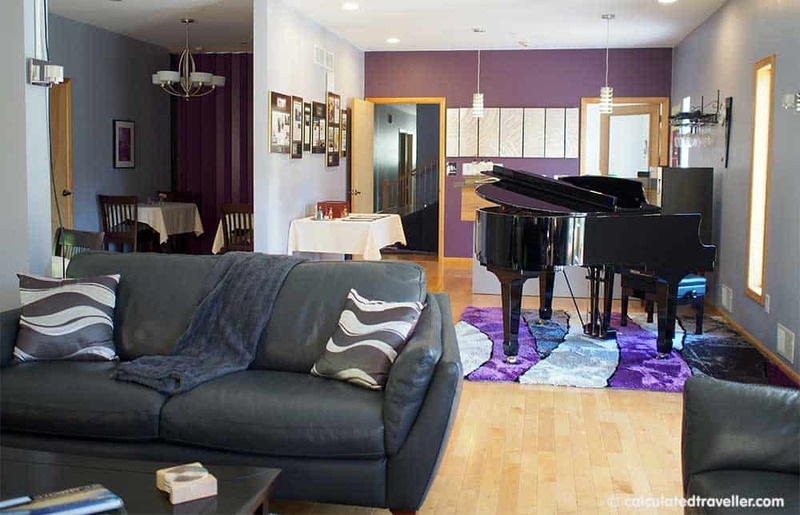 Hardwood covers the floor, and there is a quiet air conditioning system but also a ceiling fan. A significant feature of the room for those who prefer a natural breeze is a screened french door to keep open at night should you want fresh air and a little balcony with a view of the back of the property. There are little luxurious touches throughout the room, two clock radios, comfortable bathrobes, slippers, memory foam bath mat, nightlight, heated bathroom floors, signature toiletries, and complimentary bottled water. Thoughtful amenities include a coffee station in the hallway with complimentary Keurig coffee and assorted teas making it perfect if you are an early riser and wish to take your tea out on the patio. Note: that there is no refrigerator, safe, or telephone in the room and some items such as an iron/ironing board are available upon request. With electronic key card locks and an elevator should you have luggage or don’t want to take the stairs up one floor. River Spring Lodge has the amenities of a boutique hotel but exudes the charm and cosiness of a B&B or Inn. Note: A few oddities, the dining room essentially spills into the lobby/sitting area, and since my girlfriend and I (fellow travel writer) were staying in separate rooms, we decided to grab our laptops and a coffee and sit on the comfy sofas to work and chat. Spending time in the living room was fine until the dinner hour started and guests started coming down for their evening meal. – Blue crab, shellfish stock, corn, butter and cream. 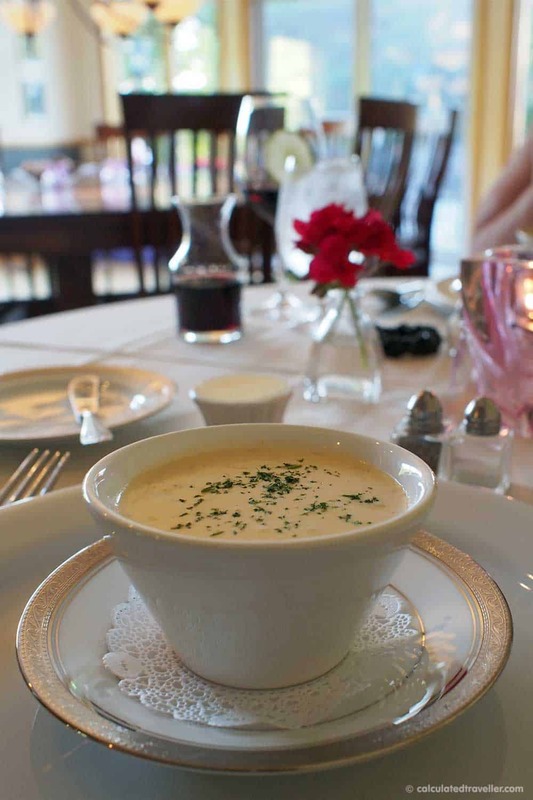 The bisque was rich and creamy and a perfect start to my meal. – Served with an assortment of fresh house-made dressings. – Odd that I’m writing about the dinner roll, but I have to say that this was one of the most enormous, most delicious rolls that I’ve ever eaten in my life. 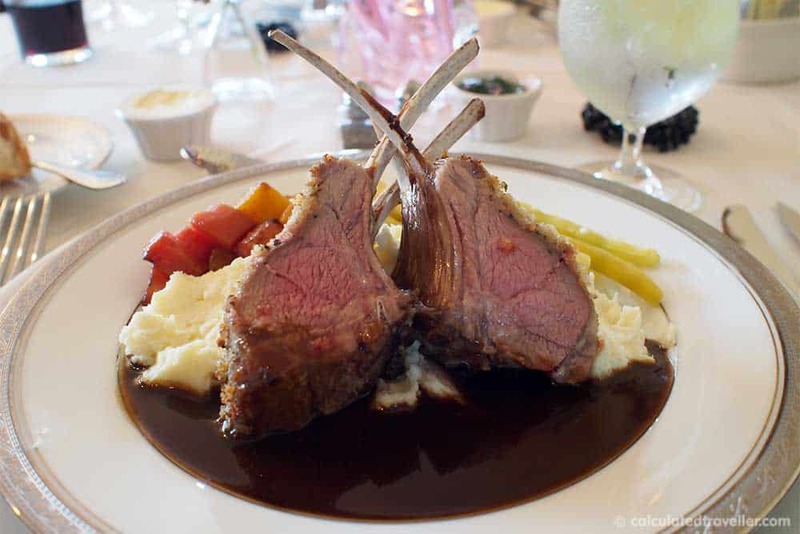 – Served with mashed potato, roasted beets and yellow string beans, and a demi-glace, red wine and cream reduction. 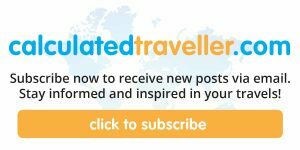 – I’m a huge bread pudding fan but this was my first time eating New Orleans style bread pudding, and I found it too wet and soupy although the flavour was delicious. Everything was absolutely delicious, well executed and beautifully presented. 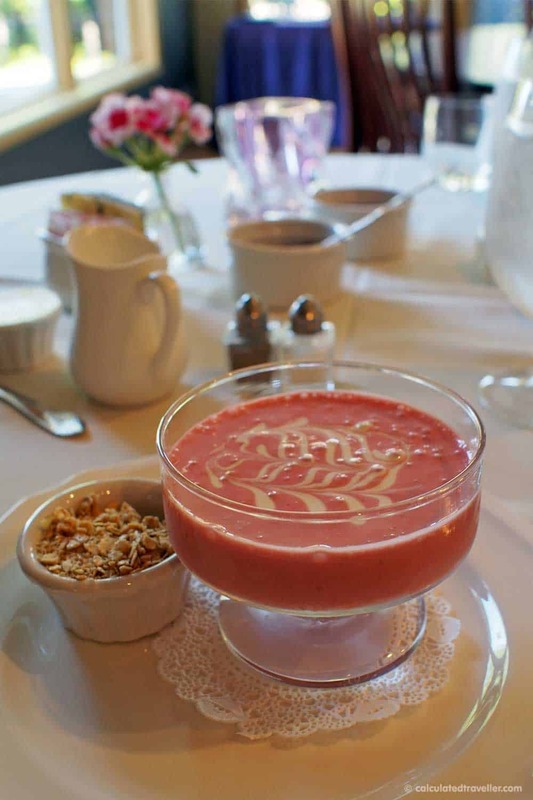 Chef Dave is a graduate of the CIA – Culinary Institute of America, and the River Spring Lodge menu offers a lot of mouthwatering selections. Take note that if you do plan on having dinner at the lodge, you need to make your menu selection 24-hours in advance as each course is made fresh specifically for each guest. 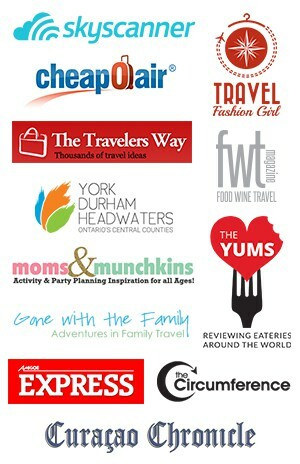 As a result, your choice is highly customizable if you should have any special dietary needs. With a full liquor license in the hotel, wine and liquor are available for purchase. You don’t need to be staying at River Spring Lodge to dine here, guests do get first-priority, but the dining room is open to the public. In the morning after an incredibly comfortable and quiet sleep, We were treated with a 3-course breakfast of chilled strawberry yoghurt soup with granola, ham cheese egg casserole with roasted potato and toast, and a sweet chocolate chip cookie to take away for a mid-afternoon treat. We left River Spring Lodge for our next adventure well-rested, well-fed and refreshed and yearning to return again. 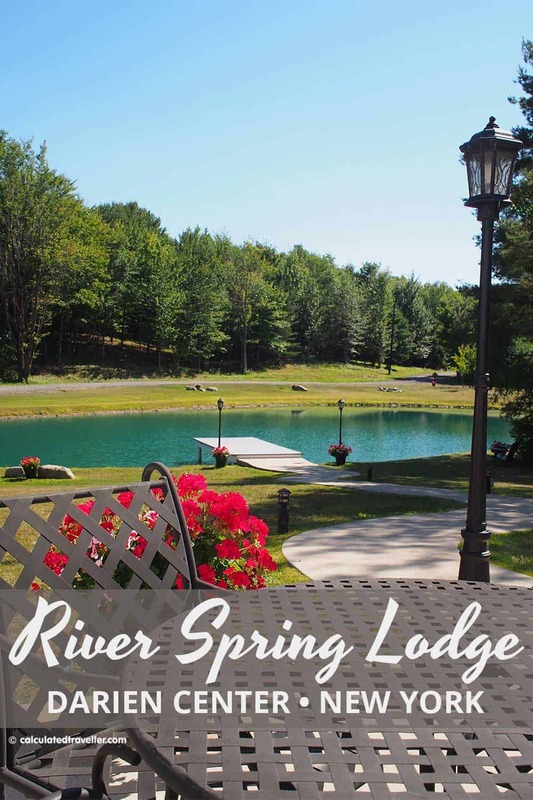 What’s nearby River Spring Lodge Darien Center New York? A very short drive away from this Darien Lake Bed and Breakfast is Country Cottage Gift Shop. 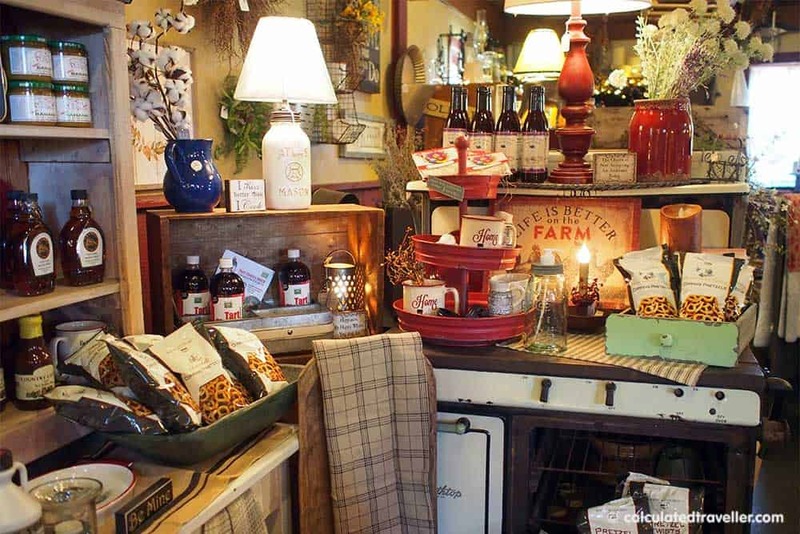 Consisting of 6 little “cottages” you’ll find everything here including homemade cookies, jarred sauces and dips, Village Candle, vintage finds, repurposed or handcrafted decor items and dried flowers from the property. I found prices to be very reasonable. If you have time and are feeling creative, owner Peggy offers 2.5-hour painting workshops using clay-based paint — similar to chalk paint. This paint is perfect for the traveller because you can complete a full project including a little dried floral accessory and it will be thoroughly dried and sealed ready for you to leave for your journey home. Of course, no trip to the area is complete without some fun and laughs at Darien Lake Amusement Park. A Six Flags property, Darien Lake, has a water park, rides, games, food and an amphitheatre for concerts on 4 km of land. 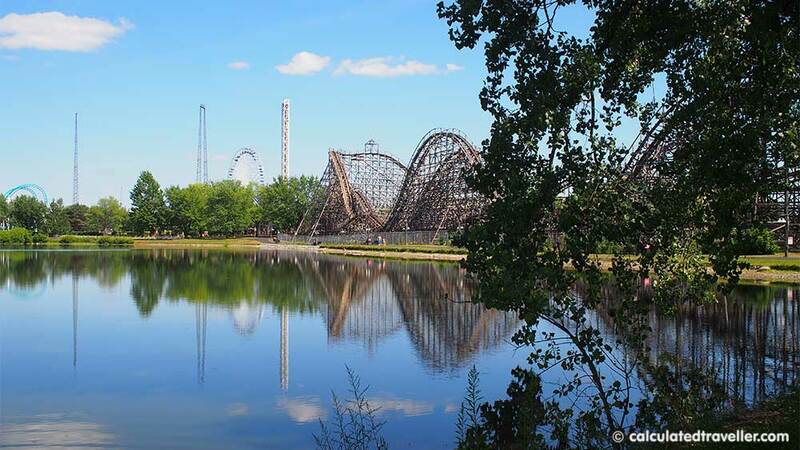 If you aren’t staying at River Spring Lodge, there are a few hotels near Darien Lake, but I suggest you take advantage of the proximity and stay at one of Darien Lake Theme Parks own RV park, hotel, glamping tents, and cabins. On the same street as Darien Lake Amusement Park is a really cute no-nonsense diner with plastic tablecloths and locals sitting at the bar called Linda’s Family Diner. 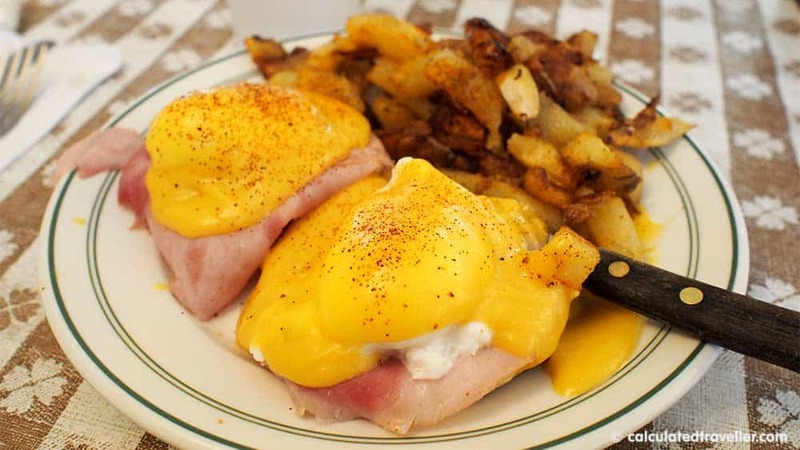 We stopped here for a quick brunch and found the food to be pretty darn tasty and prices to be very inexpensive – 2 eggs benedict with home fries and a cup of tea for under $10. Again, further down the street is a little shop called Primitives and Produce at “The Farm”. 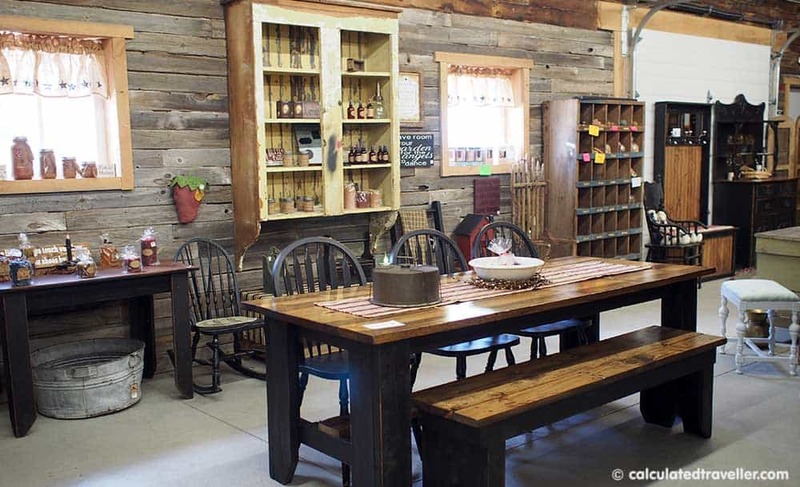 Featuring locally produced honey, maple syrup, fruits and vegetables, here you can also find antiques, reproduction, repurposed and local made decor and furniture. Travel Assistance provided by River Spring Lodge and Genesee County Tourism. All opinions are entirely my own.